What We Recently Read: "Traditional" marketing like direct mail & radio FAILED you this year because 90% of prospects now find clubs online (smartphones). The Reality: The direct mail campaigns we execute at Instinctive Insights typically drive 25-35% of a Club's overall new-membership acquisition. We quantify this be analyzing new members targeted with direct mail vs. those that were not. Digital is king, typically driving the bulk of new members with PPC, social media, geo-fencing and other online experiences, but to infer causation that "direct mail is dead" is simply shortsighted. Direct Mail is Often Executed Poorly. 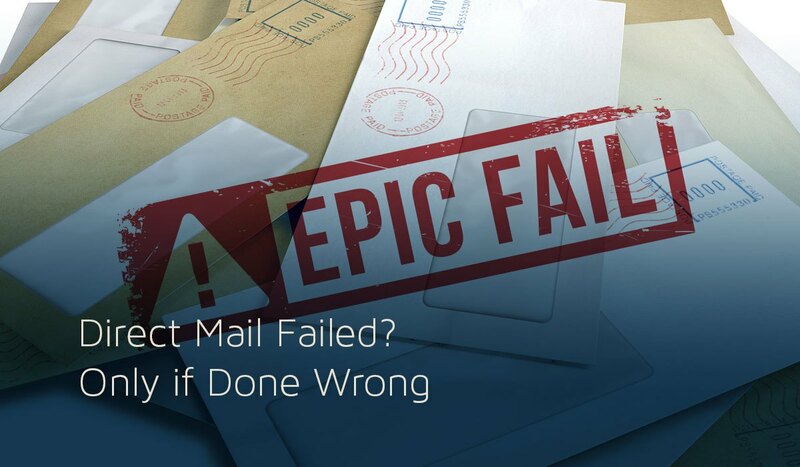 Cost is a significant challenge to a successful direct mail campaign. Conversion rates need to be strong to shoulder the cost-basis burden of postage and printing. It's a high-cost (risk), high-reward channel ... that when executed without high-tech methods, can easily become unprofitable. Let's look at some key aspects of a "smart" direct mail campaign, and the types of consumers that resonate with the channel. Smart direct-mail marketers have access to more than 600 demographics, psycho-graphic and transaction data points that define the type of individuals they may choose to target. Simple "gatekeepers" like age, household composition, income, and proximity to a Club initially narrow the target audience. That's just the first step. More descriptive elements tighten a target list to households that are active, outdoors, participating in sports, reading about fitness and health, buying tennis, swimming or basketball products. There's an absolute treasure-trove of information available to make "smart" decisions about who to target. Many of these high-value prospects are probably already working out somewhere else, whether it's at home, online or at a competitive club. They may be ready for a change, but not actively searching for a new Club online or targeted properly with ads on social media. The expanse of information is also useful when presenting a Club - both the offer and the aspects or amenities of a Club that are most likely to resonate with a prospect. The visuals, amenities and services offered by a Club can be personalized based on whether a prospect is a Young Professional, a Couple, a Family with younger or older children, or an empty-nest Senior. Each prospect can be sent a different looking postcard that matches their interests, life-stage and lifestyle. It's a powerful way to present the Club as a place for people like them. Email is cheap. Social media is cheap. Did it reach the intended audience and did they even look at it? Did an email make it to the email inbox? If so, was it one of the many immediately deleted because the prospect had 100 to deal with? Did a cleverly-placed Facebook ad get their attention, or was it scrolled by in the deluge of ads? One undeniable truth about direct mail ... it gets there ... and it must be looked at and dealt with. The online world presets a lot of challenges to linking sales back to activity. While there is value in measuring clicks, click-thru rates, impressions and ad spend, what Clubs really care about is member acquisition. Direct mail makes this easy - when data is managed properly. We know who we mailed (name and address), we know when it was delivered, and we match that data back to a refreshed membership roster to see if a target household joined after the delivery date. It sounds simple, but too often we see misguided approaches that lead to inflated results, or even worse the old conundrum of "did this really work?" questioning. Are the Best Prospects All Digital? It's safe to assume most everyone is online to one degree or another. But, are they online in a way that PPC and social media can reach them? Affluent, busy, professionals and executives - young and old - don't have the time they once did for an expansive relationship with social media. They don't have the stomach for endless searches and reviews online. Clubs with mid- to higher-tier membership dues are typically vying for the attention of a higher-income and wealth household that has less time and inclination to wade through online noise. Algorithms Guide the Data-Driven Opportunity. There's opportunity with any persona we target for direct mail, but the expanse of that opportunity varies greatly. Seniors and Families typically resonate more with direct mail. Couples without children follow behind. And ... big surprise here ... young professionals are the least likely to resonate with direct mail. That doesn't mean we write them off. Predictive Algorithms - using the treasure trove of data - carve out the percentage of a target persona that will produce profitable ROI where direct mail is concerned. We may target 10% of senior households, 8% of families, 5% of couples and 2% of young professionals; keeping direct mail "smart" and under control with respect to how each persona resonates with the channel. And ... digital can pick up the rest where direct mail is not effective enough to justify incremental spend on postage and printing. Knowing who NOT to target is equally as important as knowing WHO to engage. If Direct Mail hasn't worked for a Club in the past, let's ponder why it didn't or isn't working, and talk about applying a high-tech method rooted in data science and persona-specific personalization. Is your club database reliable?